This is the first game in the Elevator Action series. 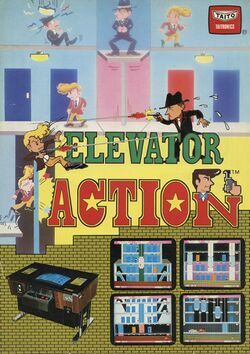 For other games in the series see the Elevator Action category. Elevator Action is a deceptively captivating game. At first glance, it seems like a simple game involving an agent who must make it from the top of a building down to the bottom through the use of elevators and escalators. With only one type of enemy present throughout the entire game, it sounds like it should be a walk in the park. But once you start playing Elevator Action, the game reveals its complexity. With the number of ways that you can kill or be killed, and the red doors that you must make your way to and enter, this simple game becomes a true test of strategy and skill. You start at the top of every building. You must work your way down to the bottom. Along the way, you will encounter enemy agents. You can shoot them, drop kick them, or squish them with an elevator if need be. You must find all of the red doors in the building and obtain the documents contained inside. Once you have them all, make your way to the basement level to find your getaway car and advance to the next building. Never reaching the legendary hit status that other arcade games released around the same time enjoyed, Elevator Action became a cult classic. It was released for a number of systems around the world. An Atari 2600 was under development and very close to completion when Atari changed ownership and the plug was pulled on the project. The game was officially released in limited quantities to retro gaming fans at the 2001 Classic Gaming Expo. A Windows version was released in Japan. A portable Game Boy version was published that includes the addition of multiple weapons. The original arcade version is contained in the Game Boy Advance release of Elevator Action Old & New. As super-sleuth Agent 17, code name "Otto", you must come out from undercover to accept a top-secret mission. Your country's security is at stake. You must sneak through a heavily guarded, top-security enemy defense building to steal secret government documents. Only well-planned strategies, bullet-dodging, quick-on-the-draw accuracy and black belt karate prowess will allow you to succeed! If you fail, your government will deny any knowledge of your or of your assignment. Good luck! You start at the top of each building. You can fire your gun to the left or to the right. You can jump over bullets, or squat underneath them. You can hop in elevators and control them up or down. While in the elevator, you can't squat. You can also ride on top of the elevator, but you won't have any control over it. Enemies will shoot you. If you are hit by a bullet, you lose one life. You can shoot the enemies, jump on top of them to knock them out, squash them with the elevator, or drop a ceiling lamp on them. If you shoot the ceiling lamp, the building goes dark temporarily. During this time, the enemies are slower to react to you. You must find all of the red doors and enter them to grab the documents before you can exit the building. Ride the elevators all the way to the basement level to escape in your getaway car. This page was last edited on 11 February 2016, at 02:33. This page has been accessed 16,160 times.